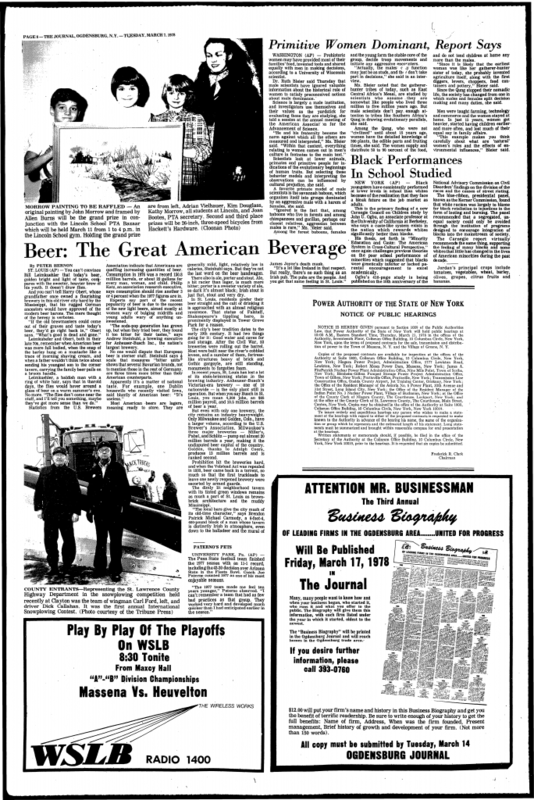 All the tensions inherent in American brewing in 1978, when the craft brewing revival had barely dawned, are displayed in an article published that year in the Ogdensburg, NY Journal. The story came in on the AP wire from St. Louis and focused on brewing in the city. It profiled Anheuser-Busch, by then the sole brewer in a city that once had dozens of them. It starts by interviewing two men in their 70s who testified how beer had more sweetness and snap in their youth. They were right, as studies of 1930s American brewing processes amply demonstrate and as discussed here earlier. The article then interviews an executive of A-B who states that beer today is meant to appeal to a generation that grew up on soda pop. He notes, in a hardly complimentary way in retrospect, that typical American lager was one-third as bitter as current Bavarian examples. The output, employment complement, and economic importance of A-B are discussed with admiration, hence to suggest while it is a survivor in a town once famous for brewing heritage, brewing in the city should be regarded for what it is today. The article notes that Milwaukee had greater output due to its three surviving breweries, but with the implication that the one brewery left in St. Louis wasn’t going anywhere soon. And true enough that was. There is no suggestion that new breweries can start up, in St. Louis or elsewhere: that likely would have seemed impossible to the writer. There is no discussion of imported beers, probably because they were negligible in St. Louis then: it was and is not a New York, San Francisco, or sui generis incubator of societal trends such as a Boulder, CO. There was no discussion of home-brewing, which was still unlawful and would have had little impact in the state at that time. No, the game locally was A-B and would remain A-B due its vital role in the economy: that’s pretty much where beer was at in the community. The story ends on a human note, profiling Brendan Carmody who ran an Irish-style pub in the city. The Irish-sounding Carmody made the perceptive comment that pubs really aren’t even famously Irish: at bottom they are about people and that’s what makes a pub superlative (or not). And true enough, once a beer supply is assured, and A-B was more than capable of doing that, it’s people who tend to give a bar its keynote. If the vibe isn’t right even in green Ireland, the fact that it is “Irish”, or may have great beer, lends no imprimatur (is the implication). Carmody sounds like a people person, someone who understood his trade well. I wonder if his bar, not named, still exists. I hope so, and that he does too, some 40 years on. Still, I suspect the writer had doubts whether the beer was really more or less an afterthought. He quoted an Irish visitor who called American beer “useless”. That must have caused a frisson, more than reveries of aged men who might be gilding the lily of their youth. By 1978 New Albion Brewing in Sonoma, CA was bottling cloudy pale ale full of the Cascade hops released to market by the USDA only a few years earlier. A spate of new breweries and brewpubs opened in the next two years, and most failed along with New Albion, but many of the next crop, from 1980, did better including Sam Adams, Sierra Nevada, Boulder Brewing, Redhook Brewing, and Hales Ales, all of which still exist. And a few years ago the seeming powerhouse A-B sold out ignominiously to a truly powerful Belgian- and Brazil-based brewer with a world perspective, InBev, now called AB-InBev. It makes one-third of the beer sold in the world. 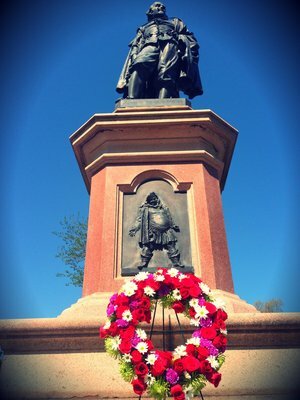 The Shakespeare statue with its fine bas-relief of Falstaff is still in Tower Grove Park. You can’t see it on the immobile features of a statue, but I know that in the last decades a special smile graces the ale-loving bon vivant, Falstaff. Yes, the brewery named after him in St. Louis (the former Lemp) had petered out by 1978 and the beer finally did too c.2005. But beer is back in the city in all its plenitude and glory heavily bittered or otherwise. Lisa Brown described the richness of the current brewing scene in Missouri in this 2017 year-end article in the St. Louis Post-Dispatch, entitled “St. Louis Craft Brewers Expand Facilities as Competition Mounts”. As the appeal of craft beer has grown in recent years, dozens more breweries opened their doors. There are 81 craft breweries in Missouri now, including several dozen in the St. Louis region. That’s nearly double the 43 craft breweries that existed in Missouri in 2011, and 58 more are in the planning stages. And lo, Budweiser still steams away mid-town, maybe with not as many employees as 40 years ago, but still doing well under direction from Brussels and other international nerve centres of AB Inbev. Win-win, perhaps. Old Will is long-gone but he’d have liked that quintessential American locution. Note re images: the first image was sourced from the issue of New York Historic Newspapers identified and linked in the text. The second is from the website of Tower Grove Park, a public park in St. Louis. The quotation is from the 2017 news article by Lisa Brown identified and linked in the text. All intellectual property in the sources belongs solely to the lawful owners, as applicable. Images and quotation used for educational and historical purposes. All feedback welcomed. I know a lot of people have problems with the craft/micro movement but from this article it obviously filled a need/niche that was not accounted for by the industrial brewers. It gave us choice and brought Americans back to ale. It also returned local brewing back to the USA and I suspect to some extent Canada. I think in a sense the author forecast what came to be, but discreetly.